Templates complete with insurance and general interest content that you can print and mail yourself (or ask us to print and mail for you). Edit them as much as you wish! Listen to Phil's story and read more by clicking here. Most insurance newsletters are boring and insult your clients' intelligence. That's bad for you and bad for business. We believe in helping you form a real relationship with your clients. If you send out a newsletter on a regular, monthly basis, we promise you that you will be in the top 10 percent of all the agents in your area, and it’s our passion to help as many businesses as we can reach that position. Whether you just write homeowners and auto, or you do the full range, we've got something for you. With 5 newsletters on offer each month, you can send personal lines content to your individual clients, business lines to your commercial clients - or mix it up! We don’t believe in taking your money and then ignoring you. You can always reach us by phone or by email. Print and email insurance newsletters to help with your insurance marketing. 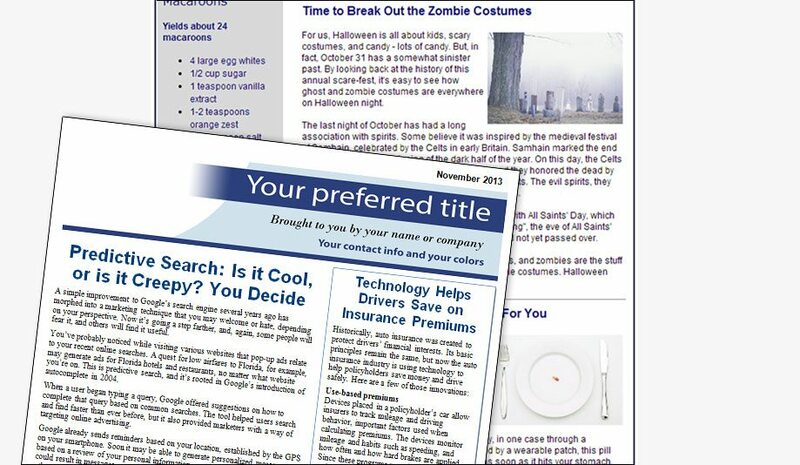 Use our ready-made newsletters or ask us to build a custom insurance newsletter just for you.